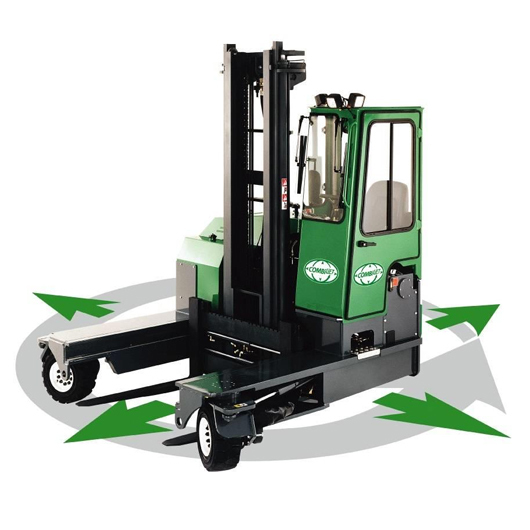 Combilift 4 Way Forklift Lift Truck | KMH Systems, Inc.
Combilift is the world’s first IC engine-powered all-wheel-drive multidirectional forklift. It is actually a combination of forklift and side-loader, and is highly maneuverable, very safe, very cost effective and supremely efficient. Safer Product Handling, Space Savings, Long Load Handling, Indoor and Outdoor Use, Increased Productivity. Combilift’s product range offers a variety of solutions to answer your material handling needs. Our product range can be customized to meet your particular requirements and offer the best possible solution for your needs. The range of customized Combilift products on offer is as varied as the differing requirements in the lumber industry itself. Whether you handle extreme lengths of engineered lumber, timber frames, palletized goods or a mix of building products, Combilift has the space saving and safe solution. From heavy duty operation in the harsh environments of sawmills to the precision manufacturing of furniture and staircases – there is a Combilift model to suit your requirements. Operating 4-way Combilifts in the galvanizing sector offers great manoeuvrability and efficient material handling of long and heavy loads in relatively confined spaces whilst also conforming to the highest levels of health & safety. Customized features such as a tapered platform make for more secure transportation. The three most popular models within the galvanizing sector include the Combi-CB, C10000XL and C14000 models. Loads don’t come much longer, heavier or bulkier than those handled in the steel industry and the wide range of capacities and customized features of the Combilift range fit the bill for the varied requirements of this industry. Rolled steel, tubes, bars, and plates can be handled safely and within narrow confines, both inside and out and on less than ideal ground surfaces. The cost of warehousing space as well as the ongoing expense of utilities to keep premises heated, lit and maintained can be reduced by maximizing the use of all available space. The manoeuvrability of the Combilift range cuts out the need for “dead” areas needed for less nifty machines, low platform heights eliminate underutilized low bay storage and impressive lift heights – even with very heavy loads – allow for optimum exploitation of every inch of vertical space. The combination of guide rails fitted to aisles and rollers on the trucks offer the advantages of quicker access and travel down the aisles. Once in the guided aisle the trucks ‘self steer’, enabling quicker and easier stock location whilst greatly reducing the risk of damage to stock and racking. Combilift enables long lengths of plastic piping to be manoeuvred easily in and around any plastic facility, with Combilift once again proving that this multi-directional forklift is the answer when it comes to handling finished ranges of product while reducing storage space required. With the possibility to customize each truck with many features such as wedged platform decks or a hydraulic fork spreader this is the robust solution for stable and safe handling that copes easily with 24/7 operation in a tough environment. Combilift manufactures a wide and varied portfolio of customized 4-way forklifts, all of which are designed for the safe and space saving handling of the large and bulky loads typically handled in the aluminum sector.